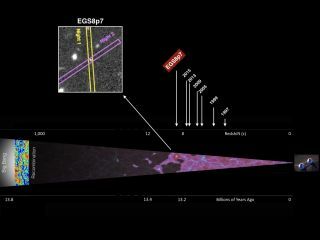 W. M. Keck Observatory researchers confirmed EGSY8p7 as the most distant galaxy whose spectrum places it at a redshift of 8.68 at a time when the universe was less than 600 million years old. Image released August 5, 2015. Astronomers found the most far-flung galaxy ever discovered, NASA's Curiosity rover celebrated three years on Mars and Europe's Rosetta mission marked one year in orbit around a comet. Here are Space.com's top stories of the week. What will New Horizons' legacy be?